The UK branch of the international medical charity Médecins du Monde has said it is bewildered by claims that it appeared on a list of targets of British and American intelligence agencies. The Guardian newspaper reported on Saturday that Médecins du Monde, which provides medical care for vulnerable people around the world, and the children's aid organisation Unicef were on a leaked list of targets of the UK intelligence agency GCHQ and the US National Security Agency. The newspaper said the length or extent of any surveillance was unclear from the documents, but that the individuals and groups listed had an identity number in the agency's "target knowledge base", so had been specifically targeted rather than caught accidentally. The documents on which the report was based are the latest to be leaked by the NSA whistleblower Edward Snowden. Leigh Daynes, UK executive director of Doctors of the World, the UK branch of Médecins du Monde, said its doctors, nurses and midwives were not a threat to national security. "We’re bewildered by these extraordinary allegations of secret surveillance," he said. "If substantiated, snooping on aid workers would be a shameful waste of taxpayers’ money. He said there was "absolutely no reason for the charity’s operations to be covertly monitored". "Our medical professionals, many of whom are volunteers, risk their lives daily in countries such as Mali and Somalia, and in and around Syria. We have nothing to hide. Like other humanitarian actors, we adhere strictly to the fundamental principles of independence, neutrality and impartiality in our work." He said that the charity was able to reach patients in sensitive locations because communities understood it was a neutral intermediary. "Any erosion of understanding and trust in our impartiality and confidentiality limits our ability to work and puts the lives of our staff and volunteers at risk," he said. "We are also gravely concerned about any breach of doctor-patient confidentiality, which would be an egregious impingement on medical ethics. Our aid priorities are calculated on the basis of need alone. Our aid is never used to further a particular political or religious standpoint. We have robust anti-fraud and anti-corruption policies and procedures in place." 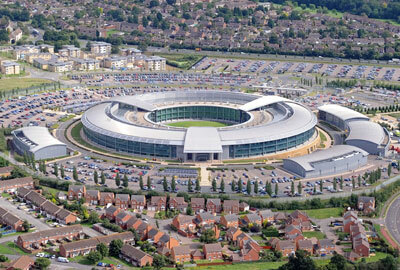 A spokesman for GCHQ said it did not comment on intelligence matters. He said GCHQ took its obligations under the law very seriously and operated one of the "strongest systems of checks and balances and democratic accountability for secret intelligence anywhere in the world. "We are working closely with our allies to keep people safe and are determined not to let speculation get in the way of our partnerships or distract us from the very real threats that we need to fight together," the spokesman said. Asked to comment on the allegations, a spokeswoman for the NSA said it did not use its foreign intelligence capabilities to steal the trade secrets of foreign companies. "The United States collects foreign intelligence just as many other governments do," she said. "The intelligence community’s efforts to understand economic systems and policies, and monitor anomalous economic activities, are critical to providing policymakers with the information they need to make informed decisions that are in the best interest of our national security." She also said the US government had announced previously that it would carry out a review of its activities around the world, including looking at how it coordinated with its allies and partners. The United Nations, which was handling press inquiries on this matter for Unicef, did not respond to requests for comment this morning.